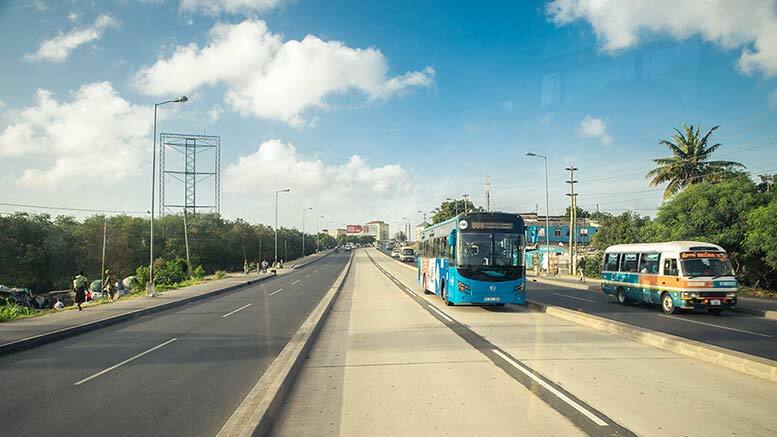 The World Bank Group President Jim Yong Kim and the Tanzanian President John Magufuli recently unveiled the foundation stone for the second phase of the Bus Rapid Transit (BRT) system of Dar Es Salaam (DART). It will entail the construction of the Ubungo Interchange, a set of overpasses at a landmark intersection leading into the city, which has been a bottleneck slowing transit on the BRT. In May 2016, the first phase of DART started operations, significantly reducing travel time and costs for many commuters in Dar Es Salaam. The new interchange is being built under the Dar es Salaam Urban Transport Improvement Project (DUTP) which is supported by a USSD 225 million concessional credit from the International Development Association (IDA) in addition to an IDA Scale-up Facility Credit of USD 200 million. “Since the BRT opened last year, it has reduced the roundtrip travel time on this corridor by 90 minutes a day, saving commuters 16 days of sitting in traffic,” Kim said. Dar es Salaam has a population of 4.4 million, which has been growing rapidly at a rate of 6.5% per year and is expected to become a mega city before 2030. The African Development Bank and the Africa Growing Together Fund, jointly with the Government of Tanzania, are financing the ongoing construction of the USD 159 million second phase of the BRT system totalling 20.3 kilometers.